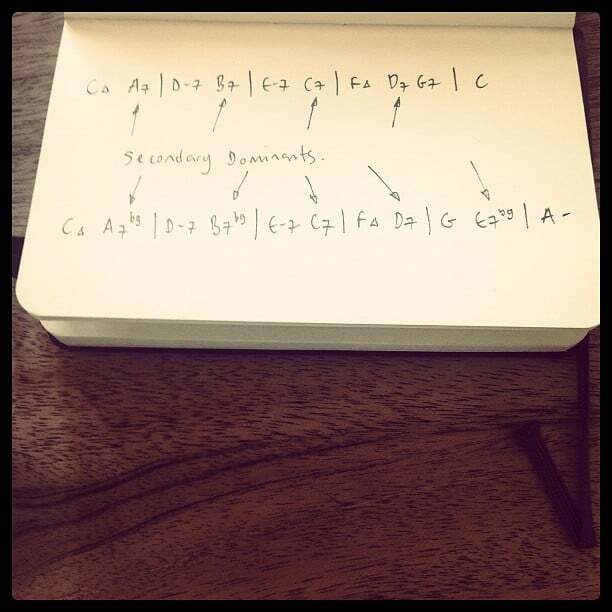 Secondary dominants are dominant chords that resolve to all the other chords in the key of C major. Nobody has ever resolved onto a minor seven flat five chord without sustaining physical injury, so don’t even try to do that. The first example could be a harmonisation for Tiptoe Through The Tulips. That’s not what the actual chords are, but it sounds fine, and it gives you a handy way to remember the first few secondary dominants in ascending order. The second example is all the secondary dominants resolving to their diatonic temporary homes. It’s a neat way of getting from C to Am in 6 bars.